Very characteristic and comfortable house. Decorated with antiques. The furniture and decorations you see are not only very beautiful, but also genuine, since the owner of the house is an antique dealer. His antiques shop is located at the front, his house at the rear. During the summer, he leaves for four months, closes his business and rents out his home. The courtyard at the shop side might be slightly chaotic, children, however, will have a great time playing there. Your side will be on the other side, where you have wonderful views over the forested hills, flanked by vineyards. The house features a terrace with a summer kitchen where you prepare and enjoy delicious meals (gas cooker, fireplace/BBQ, large dining table). Next to the house is a very cozy garden with beautiful plants, garden furniture and a lovely pool. 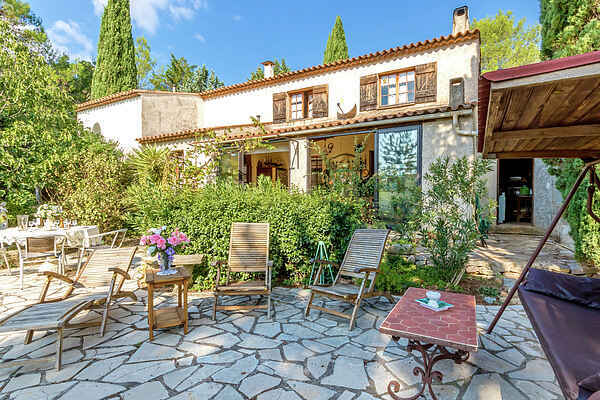 This house is located about 3 km from Le Luc, a friendly town with all necessary amenities such as shops, market, bank, post office, tennis, miniature golf, swimming pool as well as cafés, terraces and restaurants (3 km). Going north, you enter the beautiful Provence with gems of villages scattered around the area. Don't miss out on the Gorges du Verdon during one of your day trips. Going south eastwards will lead you to the coast at Port-Grimaud (39 km), with St. Tropez just 5 km away.